Evonne Goolagong spent two decades away from home, which isn't so bad when you're winning a couple of Wimbledons, four Australian Opens and a French Open along the way. But seven years ago, when she returned to Australia for her mother's funeral, she experienced an epiphany on seeing the rituals of her Aborigine people. "I realized that I had spent too much time away," says Goolagong, 46, who had left home at 13 to pursue her dream of a career in tennis. "I wanted to know who my parents were, who I was." So after winning 52 titles in 13 years on the pro tour and living for eight more years in the U.S. with her husband, Roger Cawley, daughter, Kelly, 21, and son, Morgan, 17, she and the rest of the family moved to Noosa, Queensland, in 1991. "My life became very emotional," says Goolagong, whose '93 autobiography, Home! 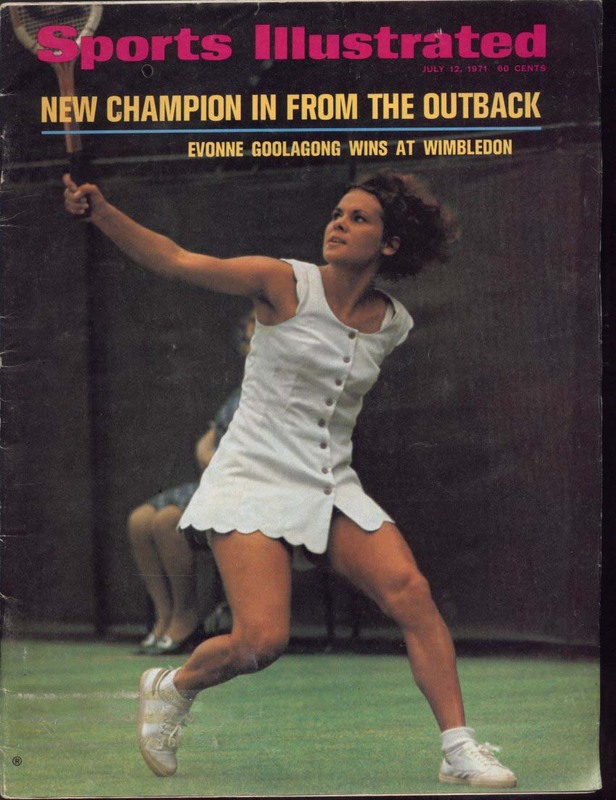 The Evonne Goolagong Story, was an Australian best-seller. "I never knew what it really meant to be an Aborigine. Then two Aborigine elders invited me to participate in a ceremony, one where you looked deep into yourself. It was the first time I had felt truly home." Well, other than when she was playing on grass or clay. Long-armed and graceful, with laser reflexes, Goolagong competed when Billie Jean King was still near the top of her game, Chris Evert was coming into her prime and Martina Navratilova was beginning to evolve into the greatest female player. At no other time had there been so much strength at the top of women's tennis. Goolagong came out of nowhere to win the 1971 French Open at 19 and then shocked the world again a month later when she routed her idol, fellow Australian Margaret Court, 6-4, 6-1, to win Wimbledon. 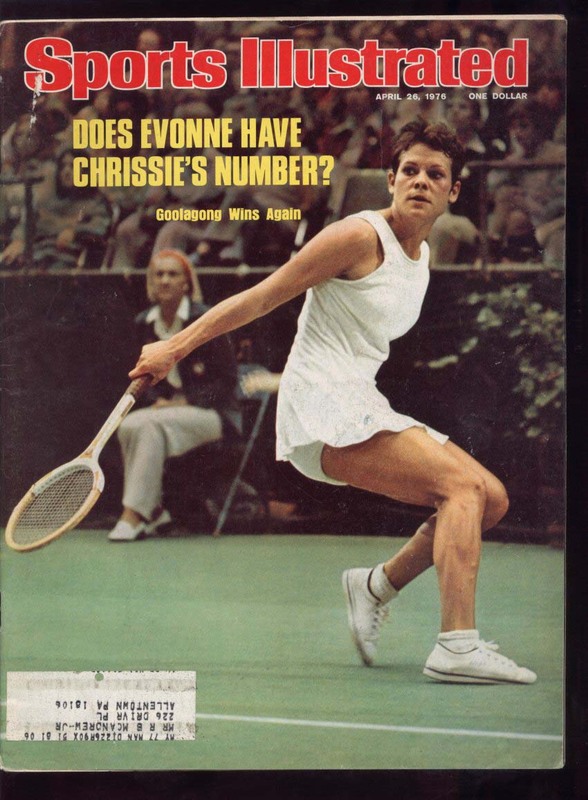 She spent the rest of the decade trying to replicate that glory, but despite a good deal of success and a rivalry with Evert that illuminated the sport, she never did. Then in 1980 she made another splash, upsetting Tracy Austin in the semifinal and Evert in the final to win her second Wimbledon. "When I was 19, I didn't appreciate it," she says. "But in '80, I had a child and nobody expected much. That was amazingly sweet." Goolagong retired three years later. She spends most of her time establishing tennis development programs and as an advocate for issues involving Aborigines, and she still competes in three or four events a year on the Virginia Slims Legends Tour. "Playing now is great fun, because the pressure isn't there," Goolagong says. "You win, it's nice. You lose, and there are other things to worry about. That puts the game in its place. In 1971, Evonne Goolagong was galvanised by the rumour that she was about to be chosen to represent Australia for the first time. At her next two tournaments, on hardcourt in Toowoomba, and grass in Brisbane, "I played my guts out," the seven-time grand slam champion recalled at Melbourne Park yesterday. 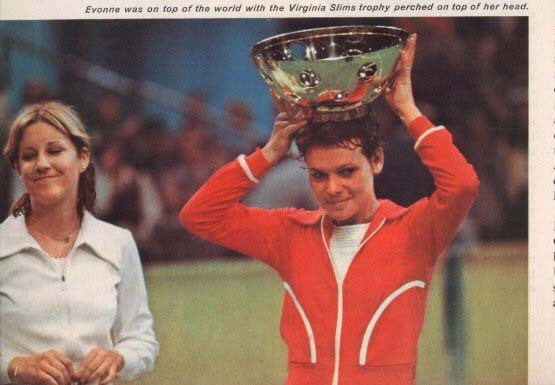 Goolagong Cawley, as she would become, was duly selected to make her Federation Cup debut, at the behest of her childhood idol and new teammate, Margaret Court. 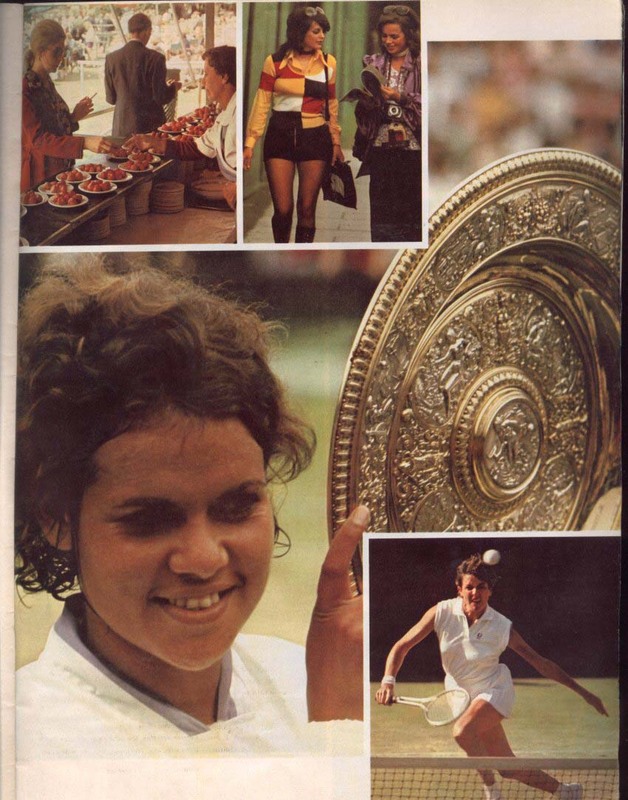 The young Goolagong was invited to stay at Court's Perth home, and went on to win both her matches in the final against Virginia Wade's English team. 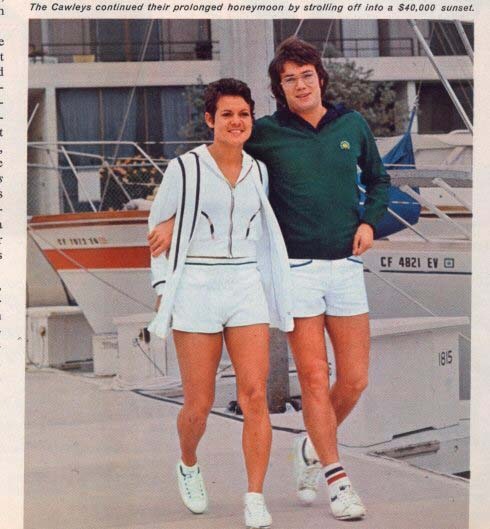 "I was pretty excited about being chosen, but being asked to stay with (Court) at her home and train with her was even more frightening, I think," Goolagong Cawley said. "I couldn't keep up with her, she was just a wonderful champion, and she worked twice as hard as anybody else, which made me try even harder. So I think (the blooding of youth) is going to be good for some of the older players who are playing Fed Cup now, too, because they have to keep on their toes." Goolagong Cawley was speaking at her first press conference as Australia's new Fed Cup captain. One reason the two-time Wimbledon winner was appointed to succeed Lesley Bowrey is because of the profile she brings to both the job and a struggling competition that lives in the shadow of the monolith that is Davis Cup. Yesterday's media turnout in the Tennis Australia boardroom was confirmation of her drawing power. Physically, she has changed little, and nor, it seems, has her passion for international team tennis been dulled by the years, many of them spent based in the United States before her return in 1991 and the subsequent exploration of her Aboriginality. "I'm quite excited, and looking forward to working with the girls," she said, after naming Nicole Pratt, Alicia Molik, Rennae Stubbs and rookie Samantha Stosur in the team that will start as a clear outsider in the first-round tie against Belgium in Brussels from April 27-28. "I played Fed Cup for seven years, (and have) always been very passionate about playing for my country." Hence, the door-closing treatment of the Jelena Dokic subject when the Yugolsav's possible return was raised yesterday. "I think she's made it pretty obvious that she doesn't want to play for Australia any more; she wants to play for her own country, and if you want to play for your country you have to be passionate about it. There's really nothing more you can say. You just move on now." While Stubbs' return to favour as the nominated doubles specialist coincides, unsurprisingly, with Bowrey's departure, Stosur's selection ahead of Evie Dominikovic was less predictable. The promising 18-year-old is ranked only 12th nationally in singles and 268th in the world, compared with Dominikovic's fourth and 114th, respectively. But this is Goolagong Cawley's team, her first as captain, and Stosur's story has one similarity to her own as a debutante 31 years ago. "I have spoken to Samantha and she didn't get much sleep, so I understand exactly how she feels," Goolagong Cawley said. "She is a player with good recent form, so she deserves to be there." Australian tennis legend Evonne Goolagong Cawley today told a crowded room at the Melbourne Park Function Centre that every Australian has the power to make their Will achieve something after their lifetime and leaving money to the Salvos is one really important way to make a genuine difference. Attending an official lunch held to celebrate the work she has done over the past year as the face of The Salvation Army Wills & Bequests Campaign, Evonne Goolagong Cawley, described her visit that morning to three Salvation Army Centres and said that she was proud to have included the Salvos in her own Will. "I always had a great will to achieve. Now I have another Will to achieve that's going to help all Australians in need. I've included the Salvos in my Will to help all Australians battling against poverty, homelessness, hunger. "I urge you to remember the Salvos in your Will after taking care of your family. You can trust the Salvos to do the right thing and if you haven't made a Will yet, please take my advice and don't leave anything to chance. There's a great peace of mind in knowing everything is settled and you will have left the world a better place than you found it," she said. Evonne took over the important position as the face of The Salvation Army Wills & Bequests Campaign last year. She has worked to reinforce the important message that when people include The Salvation Army in their Will, they play a role in changing people's lives for the better, having a flow on effect for generations to come. Income from the Wills & Bequests Program is vital for the building of facilities that enable the Salvos to carry out their work in the Australian community. Bequests are used specifically for capital development projects, such as aged care facilities, homeless centres, emergency accommodation, rehabilitation centres and community centres. Some very innovative and successful programs have commenced in recent years through the generosity of the Australian public and the express wish of people remembering The Salvation Army when making out their Will. John Dalziel, Communications Director of The Salvation Army, said the aim of the Wills and Bequests Program in 2002 is about challenging supporters of The Salvation Army to think seriously about leaving a legacy to the work of The Salvation Army to enable it to build new centres to allow the services to continue into the future. "Putting it simply, The Salvation Army could not have achieved the position we are in today without the Wills and Bequests income and we are delighted that Evonne has been able to see first hand the work that we are doing at our centres across Melbourne," he said. As part of the official launch Evonne was joined by Chief Secretary of The Salvation Army Australian Southern Territory, Colonel Les Strong, to present a number of new bequestors with an "Honoured Friends" certificate of appreciation to acknowledge their valued deferred gift. The Family Support Services Centre also in Brunswick, which assists families in meeting day to day financial and practical difficulties. To arrange for a Wills Expert to come to your home and help answer questions on how you prepare or update your Will free of charge, or to receive an information booklet Phone 13 32 30. All calls will be treated with the utmost confidence. This is part of her "acceptance" speech for the Doctorate. Aborigines should make their point on the sporting field rather than protesting at the Sydney Olympics, according to one of Australia's greatest Koori athletes. Tennis champion, Evonne Goolagong-Cawley, who was in Bathurst yesterday to receive an Honorary Doctorate from Charles Sturt University, said violence as advocated by Charles Perkins was `not fair' on the athletes. "Cathy Freeman is an inspiration for young children," she said. "They (the Olympics) are a chance to encourage kids to be the best they can, that's what we need to focus on" she added. Mrs Goolagong- Cawley also expressed disappointment in comments made by Minister for Aboriginal Affairs, John Herron, on the stolen generation. "How can someone put a percentage on it (the number of children taken from their families)?" she asked. Mrs Goolagong-Cawley recalled as a young child, hiding under the bed in case someone came to collect her. "I can remember visiting cousins in Griffith, hiding under the bed when someone we didn't know was at the front door. "It is very disappointing to hear (comments such as Mr Herron) because it is something that effects us all," she added. Despite the problems, Mrs Goolagong-Cawley said she remained optimistic for the future. "There are a lot of wonderful people out there working together, so I'm very positive about the future," she said. Relationships between Aboriginal and non Aboriginal people is something Mrs Goolagong-Cawley is passionate about and she has long been a role model not only for Aboriginal people but for all Australians. In recent years she has become increasingly involved in Australian Aboriginal affairs, working tirelessly in bringing both Aboriginal and non Aboriginal people together and changing attitudes and perceptions. Since 1997, she has worked as an ambassador for the Australian Sports Commission with the role of encouraging both Aboriginal and non Aboriginal children to be more involved in sporting activities. According to Mrs Goolagong-Cawley, yesterday's award of an Honourary Doctorate for her community and sporting was both `neat' and `an honour'. "I'm honoured to get it for something that I enjoy doing. "I love working with aboriginal kids, all kids in fact, it really is a pleasure for me," she said. Conscious of her position, Mrs Goolagong-Cawley said she looks forward to continuing her work in the community. "My job is to help kids, to show them the opportunities are out there," she said. 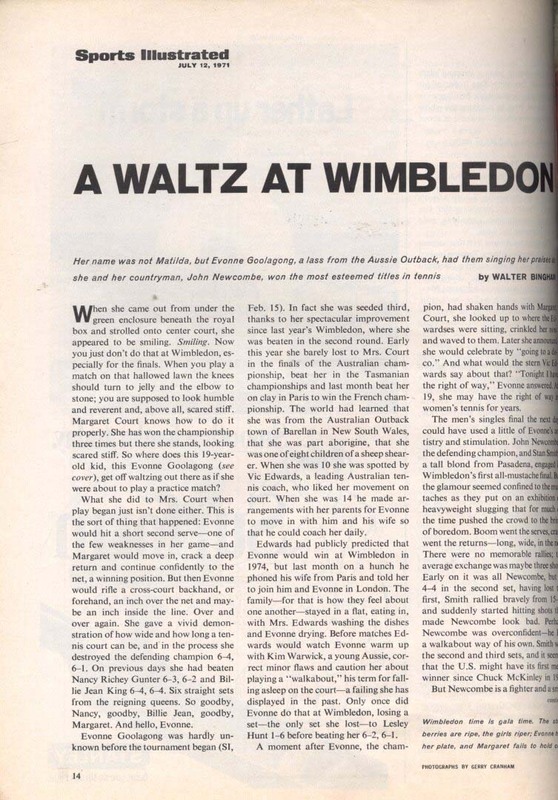 Quotes from "Ladies on the Court"
"It must have been the most exciting match I've played for atmosphere. We both played great tennis. There have been times when I've played really well and felt I couldn't do anything wrong and I've won. That day, I can still remember during some of the rallies I got goose-bumps. On a few shots the reaction from the crowd was unbelievable. They were going crazy. It was just a wonderful feeling even though I lost." Virginia:She would have been unusual even had she played in a less tough, less professional climate. But Evonne Goolagong was the first new player to emerge after tennis had gone open. She eased the transtition. After the grim struggles of the last few years women's tennis suddenly could turn a joyous face to the world. Evonne Goolagong played with a kind of giddy pleasure. She was not playing for anything, had no drive for money or power or stardom. She played because she loved it. She made tennis look natural. She's still in people's minds. She's very memorable for the comparatively light record that she has-she did play plenty of terible matches in amongst the great ones. But you wanted her to win and you would be watching her. If she played Chris your eyes would be on Evonne the whole time. "I thought it was fine till I got out there, but there weere so many people. I don't think I towelled off once or had a drink." Virginia: Evonne never thought ahead. It was her weakness and at the same time one of the reasons for her overwhelming popularity with spectators. Tactically superb as she was, all her tennis seemed to be instintive. There was nothing cold or manipulative or ruthless about it, but because she relied so much on her instincts, she lacked the mental concentration taht would have made her into an all time great rather than just a champion. 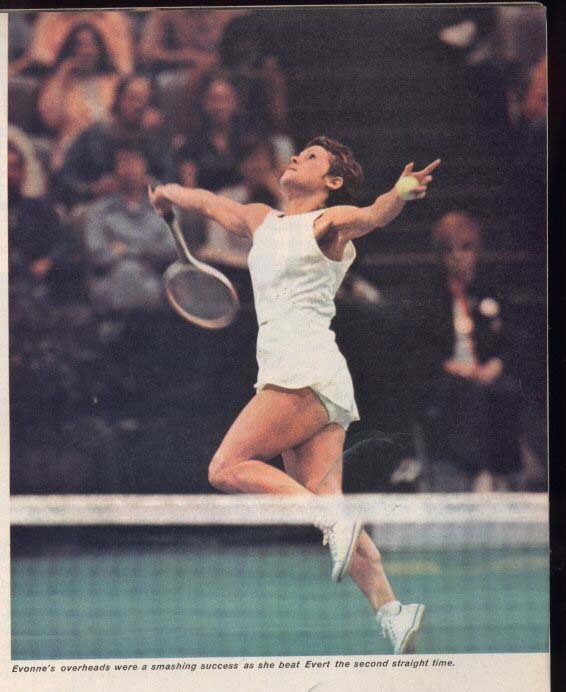 Billie Jean King: On match point or at other key times in a match she was tough, at other times, though, not so tough. She was mentally lazy, I felt. She could come off with the most unbelievable shots, just slam something off the tips of her toes, and then turn around and miss the easiest shot in the book. Virginia: Journalists, delighted to have her colourful Aboriginal origins to latch on to , said that she went 'walkabout', though in fact the term is now a derisory one in Austalia. The original Aborigines' walkabouts had been over hundreds of miles sometimes in search of better food or conditions. Evonne's were considerably less purposeful. In one match in Dusseldorf, she played dismally for a set and a half, then suddenly began to produce her most sparklingly effective tennis to rampage to victory. She had been trying to remember a tune and only when she finally got it did she realise she was in a tennis match! This unpredictability must have been heartbreaking for her oppoments. She could appear to be completely out of a match , then some spark would ignite inside her and most exquisite succession of winners would come flaring off her racquet. Chris Evert: "You never knew what to expect. And I learned that I couldn't put pressure on myself before playing her because there was nothing I could do." Virginia: Her freedom of movement-she was probably faster than any woman had ever been and certainly as graceful- and the inspiration quality of her play made her seem irresistible when she was in full flow, an unstoppable force that swept across the court like a bush fire. "Don't worry, it's all right, Evonne said, patting me softly and putting an arm around my shoulder. It's just a tennis match, don't worry , don't be upset.